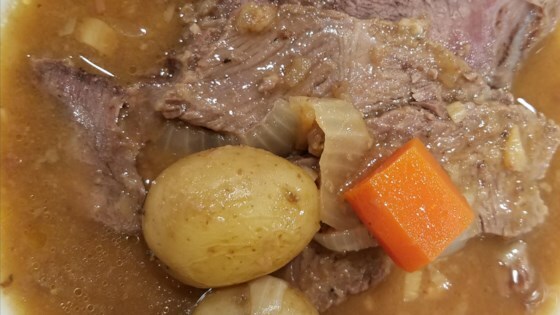 "Tasty pot roast adapted from another recipe on this site. This is great served with French bread to dip in the gravy." Whisk flour, black pepper, paprika, garlic powder, and onion powder together in a bowl. Dredge roast through the flour mixture to evenly coat. Melt butter in a large pot over medium-high heat; brown roast in the melted butter, about 5 minutes per side. Transfer roast to an oven bag and put into a 13x9-inch casserole dish. Whisk beef consomme, water, onion soup mix, garlic, and Worcestershire sauce together in a bowl; pour into the oven bag over the roast. Cut 6 small slits in the top of the oven bag for ventilation. Bake roast in the preheated oven for 1 hour 45 minutes; add carrots, onion, and mushrooms to the oven bag and bake until vegetables are tender and roast is cooked through, about 45 minutes. An instant-read thermometer inserted into the center should read 145 degrees F (63 degrees C). See how to make a simple pot roast baked with mushroom soup and vermouth. You may also add potatoes or any other other vegetable to the bag. You can also add to the water to reduce saltiness to your liking. I would thicken up the gravy next time. Making this for the second time, great recipe!! The whole family (even the picky eaters) loved it!! Super easy and delicious! I only had onions and potatoes on hand, but it came out wonderful! This recipe is a keeper!